Tennessee basketball hasn’t officially announced its non-conference schedule for the upcoming season, but we now know most of the games on the slate. Here’s a quick preview of the teams the Vols will face as the Rick Barnes era gets off the ground. Slippery Rock reached the second round of the NCAA Division II tournament last season and finished 21-11 overall. The program from western Pennsylvania gets $10,000 for playing the Vols. Alabama-Huntsville reached the opening round of the NCAA Division II tournament last season and finished 23-9 overall. It also gets $10,000 for playing the Vols. Georgia Tech lost its last five and finished last season 12-19 (3-15 ACC). Coach Brian Gregory enters his fifth season feeling the pressure that comes along with a 55-71 record. This will be the first meeting between the Vols and Yellow Jackets since 2004, and it marks the first of a four-game series. The Yellow Jackets will come to Knoxville in 2016-17 and 2018-19. In between, the Vols return to McCamish Pavillion in 2017-18. UT leads the overall series 42-27. Georgia Tech returners include: Senior forward Marcus Georges-Hunt (13.6 ppg, 5.5 rpg), senior forward Charles Mitchell (9.8 ppg, 7 rpg) and redshirt sophomore point guard Travis Jorgensen (3.7 ppg, 3.3 apg). Hunt missed last season’s ACC tournament because of a broken right foot. Marshall finished 11-21 (7-11 Conference USA) in coach Dan D’Antoni’s first season. D’Antoni, of course, is the older brother of former NBA coach Mike D’Antoni. UT is 6-3 against Marshall all-time, and has won the last three meetings. This game at Thompson-Boling will be Marshall’s regular-season opener. Marshall returners include sophomore forward Ryan Taylor (14.1 ppg, 8.6 rpg, 2.8 apg). Gardner-Webb lost its first game of the CBI and finished last season 20-15 (10-8 Big South Conference). Coach Tim Craft enters his third season with Bulldogs with a 38-30 record. UT won the only other meeting between these two teams, 71-69 in Knoxville in 2002. Gardner-Webb returners include junior center Tyrell Nelson (13.9 ppg, 6.5 rpg). UT gets two home games as part of the Barclays Center Classic. The opponent for the second has not yet been announced. UT will play either Cincinnati, Nebraska or George Washington in its first game at the Barclays Center. The result of the Nov. 27 game will dictate which of the three teams (Cincinnati, Nebraska, George Washington) the Vols meet in their second and final game at the Barclays Center. Butler beat Texas before losing to Notre Dame in the NCAA tournament and finished last season 23-11 (12-6 Big East). But the Vols beat the Bulldogs 67-55 in their meeting at Thompson-Boling Arena. Now comes a rematch at historic Hinkle Fieldhouse, where Butler beat UT 81-66 in 1958. UT is 1-2 against Butler all-time, but won the last meeting 76-71 in overtime during the 2008 NCAA tournament in Birmingham, Ala. UT reportedly reached out to Butler coach Chris Holtmann about its coaching vacancy before it hired Rick Barnes. Butler returners include: redshirt senior forward Roosevelt Jones (12.6 ppg, 5.4 rpg) and senior guard Kellen Dunham (16.5 ppg, 2.6 rpg). Florida Atlantic finished 9-20 last season (2-16 Conference USA). At one point the Owls lost 11 straight. Coach Tim Loomis enters his third season with the program with a 12-42 record. This will be the first meeting between the two teams. The Owls will receive $90,000 for coming to Knoxville. Former Vols forward signee C.J. Turman plays for FAU. He averaged 5.8 points and 3.3 rebounds as a freshman. Other FAU returners include junior guard Marquan Botley (13.1 ppg, 3.9 apg) and senior guard Solomon Poole (12.5 ppg, 3.0 rpg). Gonzaga lost to national-champion Duke in the Elite Eight and finished last season 35-3 (17-1 West Coast Conference). Coach Mark Few enters his 17th season with the program with a stellar 438-103 record. UT is 1-2 against the Bulldogs all-time. The two teams haven’t met since a UT loss in Knoxville in January 2009. This game, played at Seattle’s Key Arena, marks a rematch of the 2007 Battle for Seattle, which UT won 82-72. The Bulldogs lost star guard Kevin Pangos, but returners include senior forward Kyle Wiltjer (16.8 ppg, 6.2 rpg) and sophomore forward Domantas Sabonis (9.7 ppg, 7.1 rpg). ETSU finished last season 16-14 (8-10 Southern Conference). That included a 71-61 loss to the Vols at Thompson-Boling. This game should bring more excitement as it will be the first time new Buccaneers coach Steve Forbes meets his former team. He wore orange as a Bruce Pearl assistant for five years. Forbes has flipped much of the roster since he took the job. Names to know now include Cincinnati graduate transfer guard Ge’Lawn Guyn, junior college transfer forward Abednego “Bennie” Lufile and junior college transfer guard T.J. Cromer. Coach Dana Ford had a rough first season. Tennessee State lost its last eight games and finished last season 5-26 (2-14 Ohio Valley). That included a 67-46 loss to the Vols at Thompson-Boling Arena. The Tigers get $90,000 for their return to Knoxville this season. TSU returners include senior guard Marcus Roper (10 ppg, 2.8 rpg) and senior forward Demontez Loman. TCU finished 18-15 (4-14 Big 12) last season. Coach Trent Johnson enters his fourth season with the program with a 38-58 record. The Vols have met TCU just once before, a 73-59 loss in 1991. They’re 11-16 against Big 12 teams all-time. 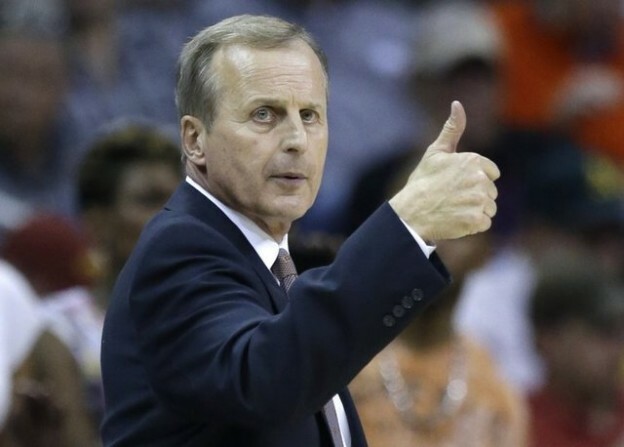 Rick Barnes has never lost (8-0) to the Horned Frogs, which joined the Big 12 in 2012. TCU returners include junior forward Kenrich Williams (8.6 ppg, 6.7 rpg). This entry was posted in Uncategorized on July 22, 2015 by Ben Frederickson. Ben Frederickson writes on Tennessee basketball. Follow Ben Frederickson on Twitter as @Ben_Fred.